On Spiral Meditations, Steve captures sacred geometry in motion. Seven shimmering, spiraling, gravity-defying musical mandalas create a kind vibrancy and energy that feeds the senses in a way that only nuanced, emotion-filled sequencer-based music can. At the same time, an overall atmosphere of tranquility permeates the listening space as each spiral meditation unwinds into the elegant beauty of the next piece, revealing delicate lattice-like melodic and rhythmic strands woven into intricate patterns. Created in the Timeroom in 2013, this is music to invigorate the heart, mind, spirit — and imagination. Una parte dell’anima di Steve Roach risiede a Berlino. Sembra incredibile a dirsi, dando uno sguardo ai più importanti fra gli innumerevoli prodotti della sua discografia: ma basterebbe tornare indietro, a tutto ciò che precedette Structures From Silence per scoprire che il maestro, come molti conterranei del suo periodo o di poco successivi (da Robert Rich al compianto A Produce, passando per Sam Rosenthal e Michael Stearns) gettano le loro origini sonore proprio nella scuola di Berlino dei Tangerine Dream e di Klaus Schulze. Un mondo da cui Roach si è allontanato conducendo il suo percorso di ricerca altrove, ma il cui elemento principale – il cosmo, appunto – ha continuato a rimanere uno dei capisaldi tematici dei suoi lavori. Capita che, ogni tanto, a Steve torni in corpo la voglia di riprendere in mano le tessiture sonore elettro-minimaliste che segnarono proprio i suoi esordi: giochi di sequencer, inchini all’analogico, intrecci di sinewaves in rotazione e un certo gusto per il modernariato sonoro. Era successo l’ultima volta quattro anni fa, con l’inatteso e spiazzante Sigh Of Ages, pubblicato proprio nel bel mezzo di una fase di transizione – quella che avrebbe condotto dal periodo dominato dalle Immersions alla fase attuale, composta principalmente di variazioni sui temi tradizionali dell’ambient spaziale, della tribal-trance e del drone. Torna a succedere in Spiral Meditations, disco dalla cui presentazione era semmai lecito attendersi un secondo ammiccamento new age dopo quello del trascurabile Rasa Dance. Si tratta invece di un flusso diviso in sette parti, ciascuna fusa nell’altra come a formare un vero e proprio enigma spiralico, dove la necessaria costruzione del concept finisce per prevalere sull’atmosfera e per minare la spontaneità del tutto. Il titolo non è chiaramente scelto a caso e l’intero magma sonoro sembra voler procedere proprio in una direzione votata all’ipnosi: “Consumed By Sunlight” fa trionfare un luccicare di stelle sulla più classica base da cielo notturno, prima che “Sand Painting” omaggi in maniera palese lo Schulze dei tempi moderni, seguito nella missione dalla liquida “Helix”. Fin qui si tratta di fatto di un maxi-omaggio alla Germania cosmica, preso però da una strada fatta di giochi di luci piuttosto che dalla gelida desolazione della vecchia scuola a cui il tutto si ispira senza nascondersi. This CD from 2014 features 70 minutes of slightly energized ambient music. Languid electronics conspire with luxurious texturals to achieve soothing vistas of temperate ambience. Expansive tonalities generate atmospheric realms crafted to approximate vaporous regions residing just beyond the listener’s focus of attention, these auralscapes establish harmonic flows of delicate oscillations. Additional electronics contribute a touch of melodic structure to those flows, enhancing the auralscape with hints of cyclic resonance. These cycles produce a mesmerizing effect with their seemingly unchanging loops, but changes do exist, they are just paced at a slow velocity, too subtle for the conscious mind to identify. There are, however, passages in which the riffs unfold at a more discernable rate; these stretches achieve a character far above the placid nature of simple ambience. There are some percussives, but they are expertly sublimated, immersed in the mix. Certain other sounds serve as a rhythmic presence, but none of them can be considered as percussives. These “beats” are achieved through the application of non-impact electronics, manifesting as bloops or slushes set to create the illusion of tempos buried within the rolling soundscape. 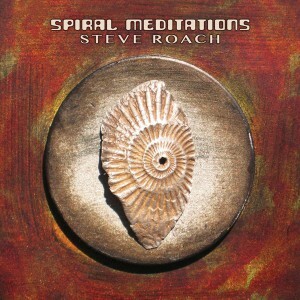 With “Spiral Meditations”, released during December 2013 on Timeroom Editions, Steve Roach shifts into cyber-tech infused trance ambient spheres. Eye-catching artwork is, as usual, designed by Sam Rosenthal and dominated by spiral talisman by Dawn Wilson-Enoch, in Northern New Mexico based painter, drawer and jewelry, talismans and medicine bags designer. Remember Dawn’s spiral fossil photo on “Live Transmission” artwork or front cover illustration on “Live At Grace Cathedral”? The connection between images and soundworlds is again precisely utilized. “Consumed By Sunlight”, which has already appeared on acclaimed Projekt’s “Possibilities Of Circumstance” compilation, opens the album in a truly impressive way. Tranquilly meandering washes guard the skies, while utterly relaxing sequences keep on shimmering. Magnificently absorbing laid-backness, more please!!! “Sand Painting”, belongs to longer pieces on this album, when getting close to 11 and half minute mark. It dives straightly into continuous flow of mesmerizingly repetitive spirals. Strong cybernetic vibes move elegantly throughout. The more recurrent are the cruising pulses, the more mindscaping ride unfolds around the listener’s ears. “Spiral Meditation”, the title track, vibrantly hits the center stage with ultra fast cyberscaping texture, enhanced by all kinds of razor sharp blip arrangements. In case you didn’t cross the gates yet, be sure you will be definitely blown away with this essentially hypnotic cyber-tech tune, a definite top-notcher!!! Shortest “Helix”, as indicated by its title, delves deeply into extremely spiraling realms. “Spiral Meditation – Part Two”, with 17 minutes the longest piece, exposes with rather calmer hypnotics, where waves of infinite soundscapes are carefully coalesced with velvety pulses coiling up into the sky domains. It slowly progresses into more vigorous oscillations and rides through hauntingly remote cascades, while full-bodied sequencer sparkles try to steal the show. Mind-bending transition is guaranteed again!!! The next tune, “The Feeling Expands”, intricately merges richly euphoric sequences, various cybernetic enrichments and warmly expansive desert vistas. “Sustained In Soul Light” reveals with more intangible sharpness of rhythms and melodies, with very delicate touch. High-tech fragments keep on emerging and tranquilly evocative sky-high blankets are amorphously drifting with pure grace and insignia of the master. Gorgeously mesmerizing finale!!! “Spiral Meditations” album is a quite unexpected work by Steve Roach, much more hypnotic-infused than any of his other sequencer-driven adventures. Be prepared for 70 minutes of a hyper modern laid-back trance ambient delicacy. Maybe not as ultra immersing as usual for this genius of sound architecture, the word “Meditations” might lead to these expectations, but certainly as much mindscaping!!! That’s why “Spiral Meditations”!! !